My precious fox spirit of an Arctic Fox turning 4 years today. – Varakitsu holding onto her special power crystal containing a small, yet powerful, portion of her ‘abilities’. Varakitsu should be 4 years old in her Dollfie form, double that in her ‘spiritual’ form. 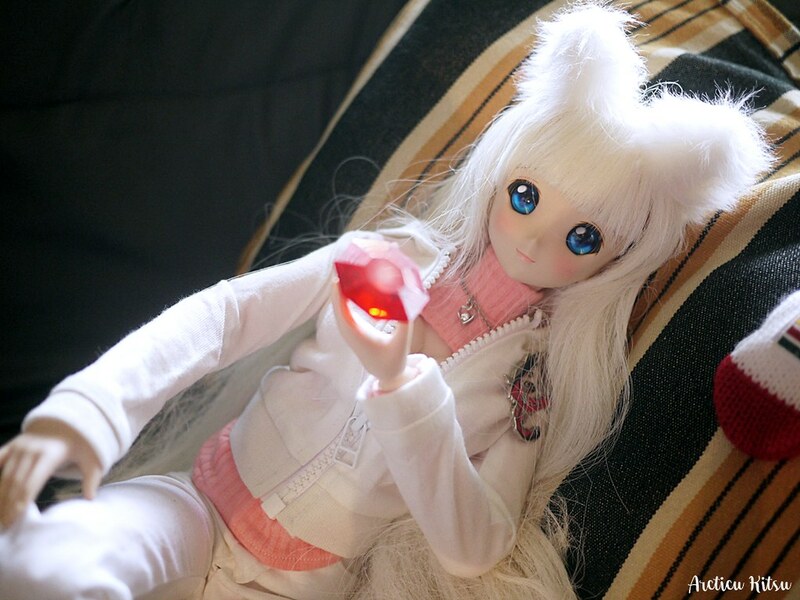 Her physical (Dollfie) form still youthful, yet her ‘spiritual’ side being double that. Still trying to grow her, mature her, and even flesh her out as an ‘original character’. What people see is just the tip of the iceberg of what I have planned for Varakitsu, yet there’s a whole lot more to her than meets the eye. A Canadian arctic fox personification of the female gender with some winter elemental powers. Not your traditional winter, yet more….’scientific’. Varakitsu’s weapon of choice would be using twin-blades, or even a simple sword. Anything that’s a blade, or claws to scratch with in the human realm, yet more severe in an alternate realm. The Varakitsu that you see right now is quite ‘tame’ from what I have planned, yet I failing to properly carry what I plan over to give to her physical form. I’m an idiot who can’t commission things properly. She also came about from my interest in Pixiv art of both cat girls & fox girls in those serious Japanese art styles. I just love my cat & fox girls in that anime manner. The beauty, that sassiness, the elegance, the lore behind them, & etc. Inari Rice messengers, among others. – Varakitsu holding onto her fluffy little tail. Canadian mittens on the side. For those that followed me with Vara may have noticed that red crystal popping in and out a lot. That’s Varakitsu’s ‘power crystal’ which contains a portion of her other-wordly powers. Something that you don’t see Varakitsu have is her ‘Fox’s Fang’ dagger because I was (again) an idiot provoking people in that unintentional manner. I fail at commissioning. It should be her standard weapon in a dagger sized shape, easily confused with the main weapon in a duplicated manner. The ‘Fox’s Fang’ is a small dagger able to be wielded by a human while the main sword version holds the actual true powers in a grander form. The latter being something that can’t be wielded by a person due to the dimension confliction. – Her hair is quite unruly as her unshown personality. She’s supposed to be sassy & such. 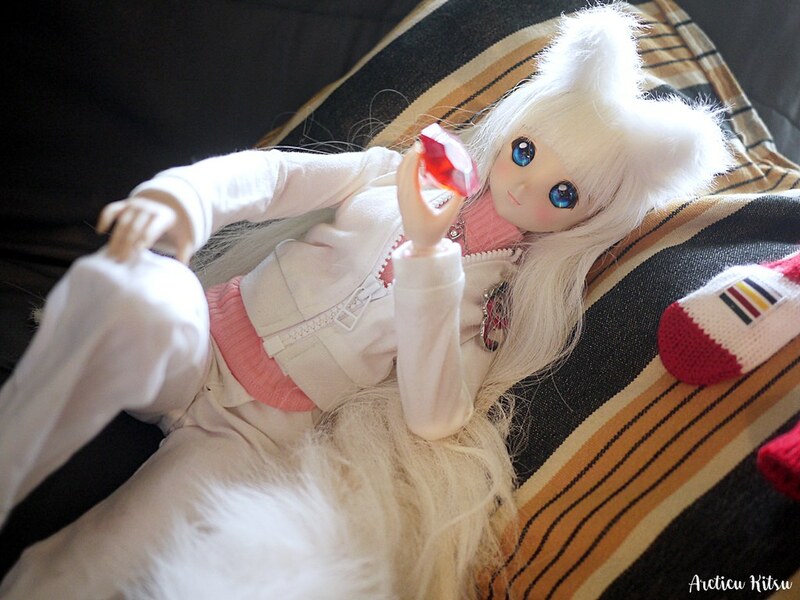 – I may need to swap her tail out for a more artificial kind as the real arctic fox fur is shrinking constantly. Wire is sticking out. – Varakitsu wearing ‘less teaseful’ clothing due to it being her 4th Anniversary in physical form. – Varakitsu: The proud & smug foxy to be also viewed as witty. That’s the type of foxy Varakitsu is, or I view her to be as. 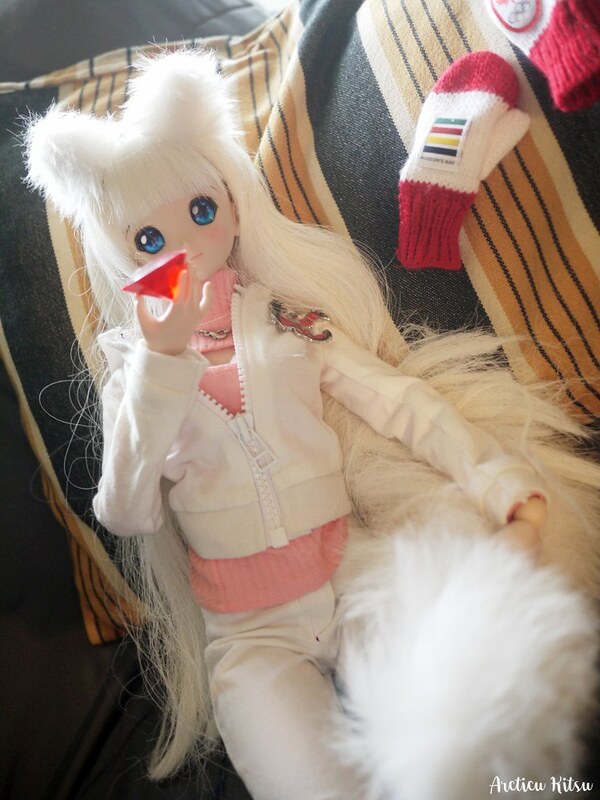 Her Dollfie form needs heavy maintaining. I now have funds, yet she’ll have to wait another year before I am able to actually dedicate time & resources back into Varakitsu. Her body, her assets, facial appearance, and such. If I can, I’d love to finally give her the weaponry she originally should have been wielding. In an experiment to try and give form to Varakitsu’s spiritual form I tried playing around with various character makers. 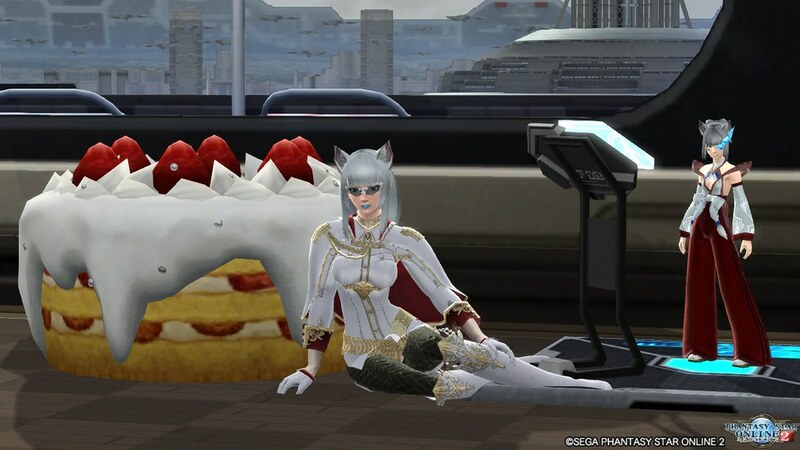 PSO2 ended up being one of those lovely games to try and give form to Varakitsu that she’s still around in that game with Renge. – Selvaria’s Valkyria Chronicles military outfit fits her perfectly. 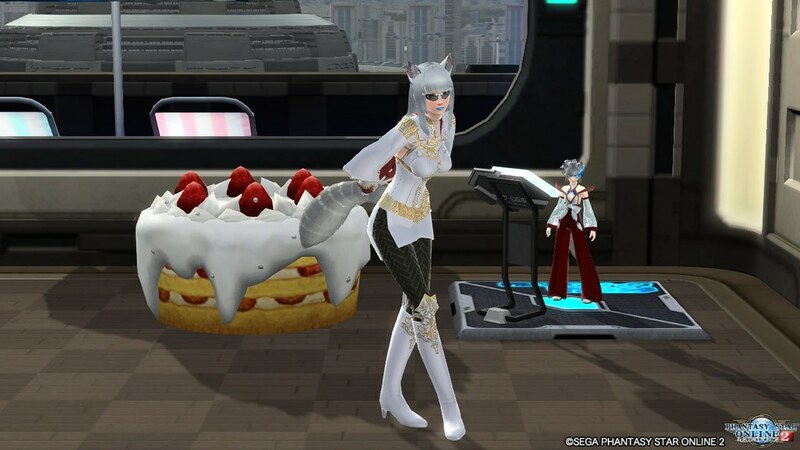 I rarely switched from anything else with Selvaria’s outfit being the best. – Varakitsu’s 4th birthday with a cake & Renge at her side. The struggle to get those fox ears was painful, yet worthwhile. Varakitsu may need some facial appearance updating. Need to change her lip colour back to red or pink. I’m saying this time and again, yet wanting to note this in this posting that I really want to see Varakitsu as a custom NPC of my crafting. I want to see her being herself in Rising World with white fox ears, white fox tails, some bladed weaponry, and even some light elemental abilities. I really truly want to flesh her out as a character so she can finally tap into her untapped abilities. To use her abilities as she also joins me around in the world of ‘Rising World’. I really want to play as myself as the main character with Varakitsu at my side as an NPC in her full abilities, as was the intention from the very beginning. If she can grow as a character in that progressive RPG manner, even better. I’m even considering focusing on a test project in an RPG maker just about Varakitsu, yet it won’t be as how I desire because Varakitsu’s far more complex than what RPG Maker would allow. It’s too basic for how complex Varakitsu is that everything would have to be simplified and dumbed down. That doesn’t make me happy. Oh, I can’t wait for Rising World to update with the ‘Player Model & Animation’ update so I can start experimenting with NPC designs. It’s going to be a major thing, more so when Rising World is an improved Minecraft with Skyrim graphics. Far more suitable to have Varakitsu in Rising World than Minecraft. Yet, it would be sweet if she was in either. The modding powers for Rising World is far more powerful and upfront that what was complex for Minecraft should be far easier for Rising World. Can’t wait! People have their doubts, yet that’s just their fear. Rising World is worthwhile of your time.